August Macke (1887 – 1914) was one of the leading members of the German Expressionist group Der Blaue Reiter (The Blue Rider). He lived during a particularly innovative time for German art he saw the development of the main German Expressionist movements as well as the arrival of the successive avant-garde movements which were forming in the rest of Europe. 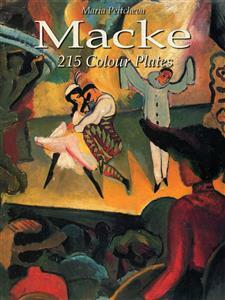 Like a true artist of his time, Macke knew how to integrate into his painting the elements of the avant-garde which most interested him.Macke's career was cut short by his early death in the second month of the First World War at the front in Champagne, France, on 26 September 1914. His final painting, Farewell, depicts the mood of gloom that settled after the outbreak of war.